Ships on the tidal Thames which meet tight environmental standards in 2019 will secure a 10% reduction in vessel conservancy charges payable to the Port of London Authority (PLA). The increased discount, 5% more than in 2018, applies to all craft registered with the International Maritime Organisation, whose emissions have an Environmental Ship Index rating of 30 or more. “The take-up of the discount for cleaner ships has been really positive,” commented PLA chief executive, Robin Mortimer. “We’ve chosen to increase the discount to make it even more attractive for operators to introduce cleaner vessels and use them on the Thames. “This is part of a broad suite of work we are doing as part of our Air Quality Strategy. Later this year we will launch Leader, the UK’s first hybrid pilot cutter, which will run on electricity for the majority of the time, rather than diesel. 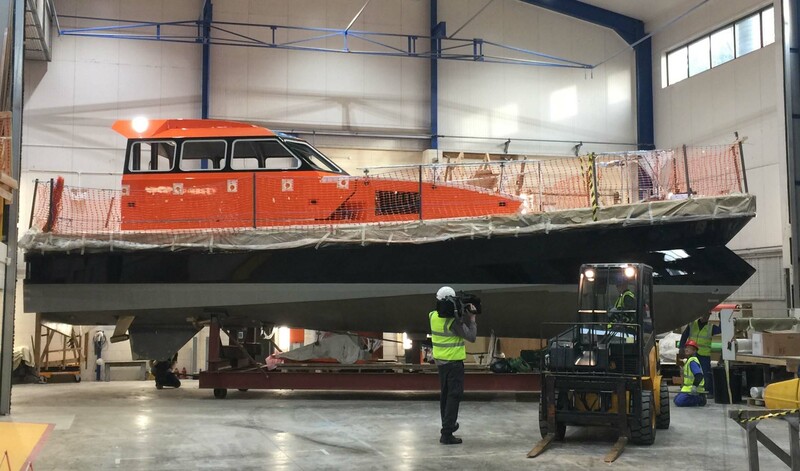 Leader is in the final stages of production at Goodchild Marine’s boatyard in Great Yarmouth, Norfolk. It will join the PLA’s Gravesend-based fleet, which deliver pilots to visiting ships, so that they can be safely guided into, and out of, port. Other recent measures introduced by the PLA to reduce its carbon footprint include the installation of solar panels to illuminate over 42 river channel marker buoys that guide vessels up and down the Thames’ tidal stretches. On Monday 28 January, Robin Mortimer is due to brief peers and MPs on the PLA’s determination to minimise airborne pollutants entering the atmosphere, on and along side the Thames, from the North Sea to Teddington. He will update members of the All-Party Parliamentary Maritime and Ports Group on progress being made towards the air quality goals set out in the PLA’s 2035 Thames Vision, the result of an extensive, two-year consultation with river stakeholders.